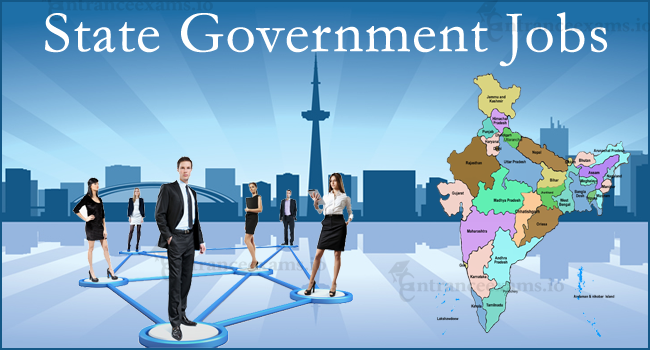 State Government Jobs: This page is completely for those candidates who were looking for State govt jobs in India. Based on the employment news updates and state government sectors, we are providing the Govt Jobs for all states. The postulants can find the State Govt Jobs here according to their qualification such as 10th, Intermediate, Diploma, Graduation etc. Along with these, one can also know the state wise PSC Jobs, Teaching Jobs, Railway Jobs, Army Jobs, Police Jobs in all states, Electricity Dept Jobs, Court Jobs, Medical Jobs, RTC Jobs, etc. Every year lakhs of aspirants compete for various government jobs out of which a few candidates will get succeed. These days in the light of shrinking job opportunities, getting a job in any government or Public Sector Unit (PSU) is a matter of pride. Although, it takes more than hard work, education and planning to get a position in the government sector. Candidates who wish to join government service must have dedication and patience. Because the selection process of the central and state government jobs is lengthy and sometimes back-breaking. Along with the State wide government job latest updates, we also provide the remaining fields such as police, defense, teaching, Public Sector Undertaking notifications on this page. To get those notifications, please make a click on the below link. In India, the responsibility to declare a government jobs are in the arms of different Government organizations namely SSC (Staff Selection Commission), PSC (Public Service Commission) of all states, RRB (Railway Recruitment Board), IBPS (Institute of Banking & Personnel Selection), UPSC (Union Public Service Commission), Central and State Police Departments, University, Health & Welfare Departments and all others that are affiliated under Govt. of India. Whereas the Jobs in railways are managed by Railway Recruitment Control Board (RRCB). Likewise, various job openings are advertised by various PSUs. Some of the well-known public sector units in India that candidates can keep a watch on for various PSUs jobs include Bharat Heavy Electricals (BHEL), Steel Authority of India (SAIL), Airport Authority of India (AAI), Shipping Corporation of India, Rashtriya Ispat Nigam Limited, Oil & Natural Gas Corporation (ONGC), NTPC, Indian Oil Corporation, and India Tourism Development Organisation, and Hindustan Petroleum Corporation among others. Every year, the authorities announce enormous government jobs through employment newspapers and the official website of the concerned department. We will collect and publish the Latest State Government Jobs on our site based on the employment news. Hence the candidates who have the passion for cracking Govt Jobs in India can bookmark this page for more updates regarding the jobs in government sector. Aspirants can find out a government jobs notification through different ways like Daily Newspapers, Employment Centers, Employment News/ Magazines, Official Recruitment Portal, the Internet and websites like entranceexams. These days, most of the candidates were searing jobs with the help of internet so we have made our website. Hence the Job seekers can find out government and corporate department jobs as per their qualification, experience from this page. Find the information of IBPS, SSC, UPSC, GATE, NET Exam. Also, Check Entrance exams for Law, MBA, MCA, Medical Stream, Engineering, etc. In India, There are 29 states and all these states have their own government. The state government officials provide the jobs in various departments such as Police, Civil services, Teaching departments, education board, universities, administration department and other departments. The central government also provides the jobs in all states by conducting written exam and an interview. Along with these, many private and semi government organizations in India provide career opportunities for the job seekers. The best way to know the latest government job openings is to keep checking this page regularly. So that you will never miss any job notification in the government sector. Entranceexams.io is a place where you can get anything and everything about Government and Private Jobs in India. Also, bookmark this page for more updates about State and Central Government Jobs in India. We update our site more often with complete information.